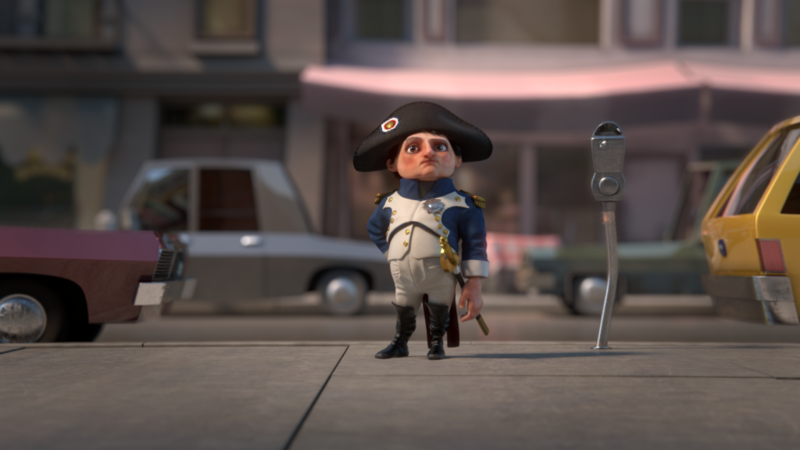 Follow Napoleon Bonaparte, everyone’s favorite vertically challenged dictator, as he learns to interact with the modern day world in this animated short film. When his trusty stead gets a parking ticket, Napoleon is forced to come to grips with his new stature in society. Napoleon | The Ticket was created and directed by Matthew Berenty, whose last animated short Love in the Time of Advertising was screened in over 60 festivals worldwide. Matthew and his team at WOLF & CROW used Autodesk Maya and Pixologic Zbrush to sculpt these quirky characters in 3D. Then artfully lit, rendered and composited them using Chaos Group’s Vray and The Foundry’s Nuke. Our goal was tell a entertaining story full of characters that leap off the screen using a minimal amount of time and resources. We hope that you feel we succeeded. Creator/Director, Character Design, Character Modeling, Environment Modeling, Texturing, Shading, Hair, Lighting, Compositing, and Sound FX. 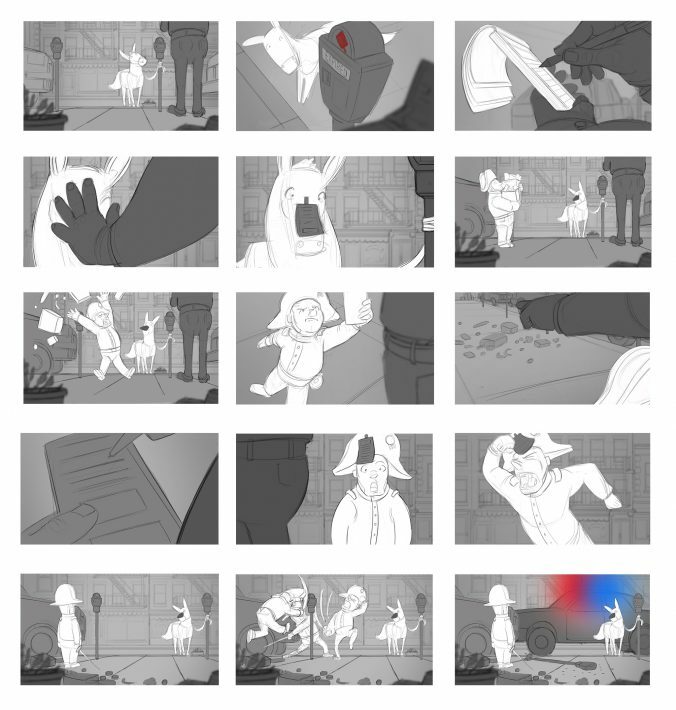 For The Ticket I worked with Alexander Curtis, a talented layout artist, to create the storyboards. In CG its easy to get too free with camera movements which can be disorienting to the viewer. Nothing is worse then a nausea inducing CG camera not matter how dynamic it is. I made it clear in the beginning to treat the camera as if we we’re shooting live action. I also asked Alex to focus on telling the story from a limited front-on perspective as much as possible. In addition to giving the camera work a stylized feel, it also limited the amount of assets which needed to be created to tell the story. Shallow depth of field was built-in from the beginning as a compositional tool for separating the characters from the background. It also creates a sense of intimacy with the character. Close-ups with long focal lengths were used to achieve this. These were mixed with wider shots to establish the environment and give more room for the characters to move around in. 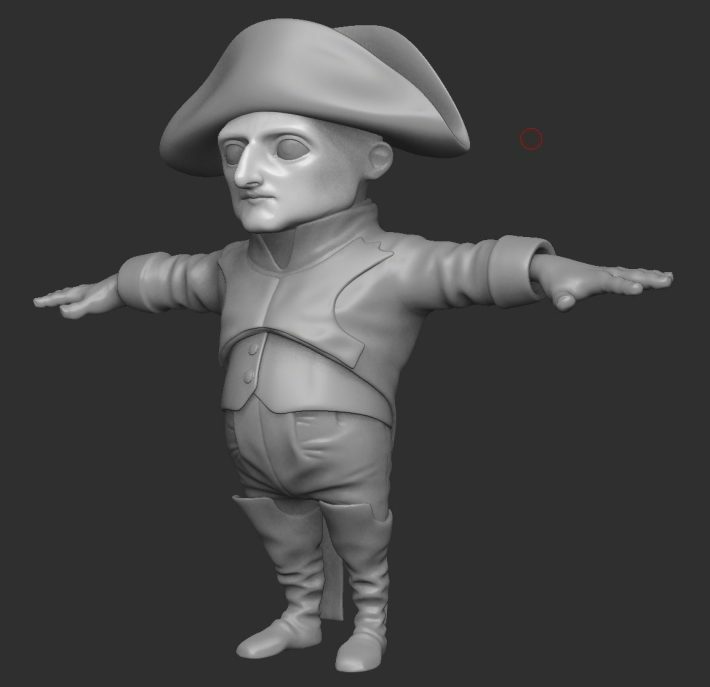 Here is the final Zbrush sculpt I did for the Napoleon himself. Zbrush makes it so easy and fun to add details and texture to your objects that sometimes you bleed into areas of the characters creation process better controlled and achieved later. My main goal at this stage is create a character who has appealing silhouettes and shapes but leave myself room to develop the character further in software more suited to the purpose. A few of the car models I did. For me the Board-o-matic is used for fleshing out the story and quickly determining holes in plot and timing that would be harder to fix further in the process. The CG Animatic resolves the actual cameras, assets, and timing in 3D space. It also acts as a conform for moving forward towards a final film. The character models should now match the final look. though a simple rig is still effective for blocking out the character posing. This is the stage where we mock-up a set and props to help determine what will need to be created. As you can see in the video we apply shot names and frame numbers to break down the piece into its component parts used as a reference for Animators. The initial styleframe I made to test the shaders and lighting setup!